Your online source for items relating to Doukhobor workmanship, skills, and heritage. Included are various crafts as well as research related materials such as books, videos and music CDs centering on Doukhobor history. Rooted in the tradition of ‘The Living Book’, there are outstanding examples of the oral tradition of psalms and hymns, as well as collections of traditional folk music. Such items have been admired from a worldwide perspective. From time to time when possible, special collectible items which are steeped in antique value will also be featured. This site will be constantly evolving as we come onto new items available for purchase and others dissappear. These are wonderful antique pieces originating in the Caucasus before 1899 and came to Canada with the Doukhobors at that time. With the Internet's Paypal method of purchase [other methods of payment accepted] along with Canada Post shipping costs, these materials are accessible to a world-wide audience. The Doukhobor Store will make these items readily available to all. We are pleased to offer these rare textile weavings which were brought to Canada with the Doukhobors in 1899. These examples of handicraft skill are an integral part of Doukhobor heritage and originate from the Caucasus. Rare artifacts, well over a hundred and fifteen years old, they are organically dyed and made from wool and hemp. Ranging in price from five hundred to two thousand dollars, they are a life time investment. The Doukhobor Store will fulfill the needs of interested clients who do not have access to Doukhobor related items that are only attainable in certain areas in a diminished fashion. We invite you to examine our categories, select an item or items, read appropriate research articles posted on http://larrysdesk.com for information on Doukhobors, and contact us directly with questions, suggestions, or comments. Thank you for visiting the Doukhobor Store. We will do our utmost to accommodate your needs and hope you will enjoy browsing through items available.. 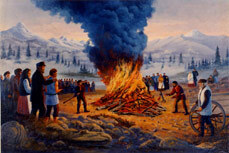 The origin of the Doukhobors is obscure. Some talk of a primitive sect in Bulgaria, the Bogomils, with similar beliefs, pre-dating their emergence in Russia. The Bogomils are identified with the Massaliani in Slavic documents of the 13th century and have most of the same beliefs. Others hearken even earlier to the Essenes, a mystical enclave where men and women were separated at prayers, men had heads uncovered, and women covered. They claimed to have a direct connection with God without the necessity of an intermediary such as a priest. Essenes sold all of their possessions, and shared all they had with the community. Jesus was supposedly a member. The hard evidence of origin is shrouded in the misty vapours of a bygone era. The originator of the word Doukhobor was Archbishop Amvrosii Serebrennikov in 1785, who said they were fighting against the true beliefs; calling them 'Spirit Wrestlers'.